Eurovision-bound Hartlepool singer Michael Rice. It is an emotional weekend for Hartlepool singer Michael Rice after he booked his place as the United Kingdom's entry in this year's Eurovision contest. Michael, 21, is off to Israel in May after winning the BBC national final live on television on Friday night with the song Bigger Than Us. 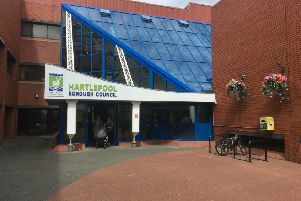 Hartlepool was certainly quick to offer its backing too after we posted the story of his success on our Facebook page. Among dozens of comments from wellwishers, Joan Macklam said: "Well done Michael. You were far the best. You did Hartlepool proud. Great song too." Dawn Waller added: "Choked me up that did, loved it, well deserved winner, well done." Katharine Anne Craggs wrote: "I have never seen him perform before. My god he is fantastic. The song is brilliant too. Well done." Carole Waterman commented: "Well Michael you certainly put Hartlepool back on the map again. You were amazing, outshone the rest." June Gate gushed: "Well done. I got shivers down my spine. Hartlepool is so proud of you." Polly Smith said: "Loved the song. He smashed it from the beginning in my eyes. Well done Michael. You did it for Hartlepool." Diane Watson added: "Michaèl Rice was absolutely amazing." "The other songs were okay but Michael's performance was world class. He deserves to represent the United Kingdom. "If anyone can win it Michael can. Gave me goosebumps. He was fantastic." Sandra Dawkins simply wrote: "He was class." Karen Welch added: "Wow you were amazing. I remember when you sang on my niece's dance show years ago."